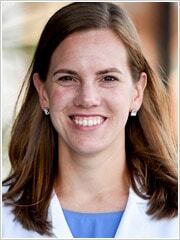 Dr. Nora Graham is a graduate of Dartmouth College and earned her medical degree at Weill Cornell Medical College. She completed her residency at Thomas Jefferson University Hospital in Philadelphia. She is an Irish Step dancer who loves to travel, having studied abroad in Ireland, Italy, Poland, and Austria. She greatly enjoys Obstetrics and Gynecology with special interests in high-risk pregnancies and cervical cancer prevention.